Arlington's new bike lanes were supposed to run through this intersection, but as of now, they won't. Image by Google Maps. In February, Arlington County announced plans to repave Washington Boulevard and add almost a mile of bike lanes from the East Falls Church Metro to the Westover neighborhood. Now, to save some parking spaces and appease a vocal minority, the county has thrown out the public process, abandoned years of planning, and determined that putting people on bikes at risk is a fair compromise. These lanes would cut chronic speeding, improve pedestrian crossings, and fill a substantial gap in the area’s bicycle network for a safer bicycle connection to the Metro, shops, restaurants, school and library in Westover. 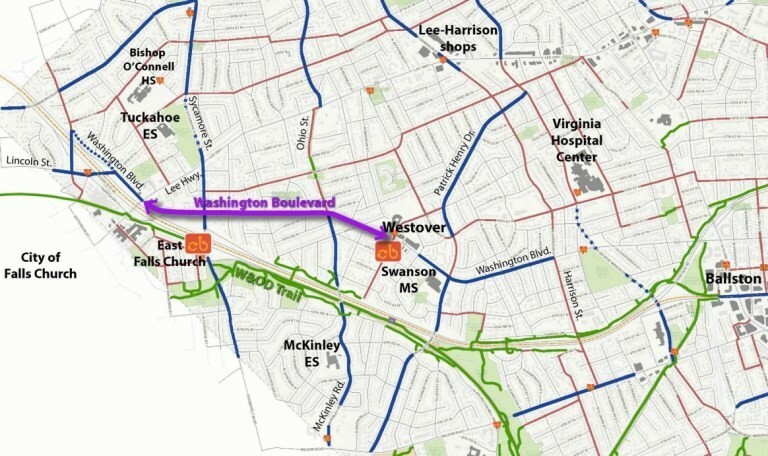 Proposed bike lanes on Washington Blvd between East Falls Church and Westover. Image by Arlington County. Following the first meeting, supportive comments poured in from neighborhood residents. 65% of comments supported the bike lanes as did 55% of comments from neighborhood residents. In the revised plans, five blocks of eastbound bike lane are removed to keep on-street car parking. Where the bike lane ends, a signed route will tell people on bikes to turn off of Washington Boulevard onto side streets for a seven block detour. The detour adds new conflict points at seven intersections, an uncontrolled crossing of North Ohio Street, and countless driveways. The seven-block detour from Washington Blvd. Would you take it? Image by Google Maps. This is unacceptable. Let's push back. We need to send a clear message to Arlington’s leaders that we will not accept a few naysayers hijacking an important street safety project. Washington Boulevard needs continuous bike lanes in both directions. If you live in Arlington and want to tell the county board and county manager that public safety is more important than street parking, you can do so from the Washington Area Bicyclist Association's form here. The final project meeting is Wednesday, April 19 (today!) and we need your help to push back against these indefensible changes. Join us, speak up and insist on a safe and direct bicycle route in both directions. The meeting is from 5-7:30 pm, with a presentation at 6. It's at Walter Reed Elementary School (1644 North McKinley Road). A version of this post originally ran on WABA's blog. Garrett Hennigan is a DC native intent on making the region more bikeable, walkable, and transit-rich. He is on staff at the Washington Area Bicyclist Association and lives in Brookland.